Warm welcome at this newly built traditional Highland home. Set by the shore of Camus Croise Bay in south Skye. Wonderful views across the Sound of Sleat to the mainland. 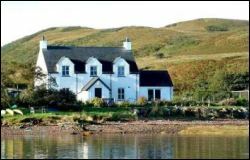 Coastal walks nearby with views to Knoydart and Ardnamurchan. Evening meals available at several local restaurants/hotels. 9 miles from Armadale (castle, gardens and ferry to Mallaig). 16 miles from the Skye Bridge. 1 with en-suite bathroom and 1 with private bathroom. Both rooms have WiFi, TV and tea/coffee making facilities. Breakfast in the dining room overlooking the garden & bay. paintings, driftwood sculptures & handmade greetings cards. Open Easter - mid October. Loch Bracadale towards MacLeod’s Tables. Spectacular sunsets. oyster catchers, seals, geese and otters. 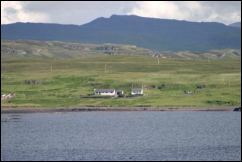 Dunvegan 7 miles. Portree 14 miles. Sligachan 15 miles. 2 double bedrooms with en-suite shower. 1 twin room with private bathroom. All with TV, DVD, radio alarm clock, hair dryer, tea/coffee. Large comfortable residents lounge with TV & DVD player. Tea or coffee with home baking in the lounge on arrival. Wide choice of breakfast menus. Advice given on walks, touring, restaurants, etc. depending on length of stay.